You read it right! 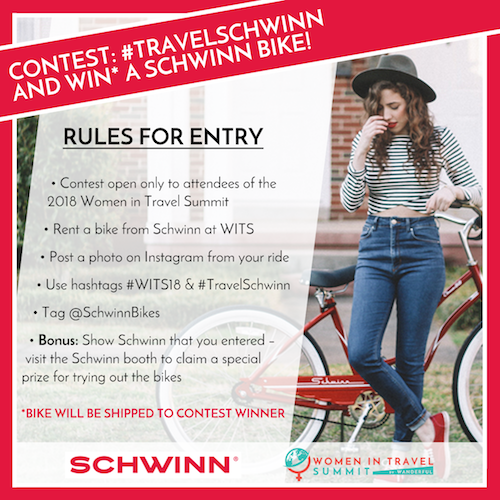 One of our amazing sponsors, Schwinn, is giving away a brand new bike to one lucky WITS ’18 attendee — and they’re lending out bikes to attendees all weekend long at WITS ’18! One of the best ways to explore #QuebecRegion is on two wheels, and with Schwinn bikes on hand during select time slots throughout WITS ’18, you can see the sites or hit the trails! The bikes will be waiting for you just outside the Fairmont Le Château Frontenac. Head out the front door of the hotel and turn left. Note: The bikes are available on a first come, first served basis with a two-hour rental time limit. Not sure where to go? Check out our WITS ’18 official bike routes. P.S. Check out Schwinn’s top tips for how to sightsee by bike and essentials to bring on a biking adventure.